A major social networking site for al-Qaida showed photos of Ramzi Binalshibh on Monday and called him a "hero" of the 9/11 attacks. The first photographs of alleged Sept. 11 architect Ramzi Binalshibh in captivity showed up Monday on an al-Qaida website, showing the accused terrorist in his cell at the U.S. detention facility at Guantanamo Bay, Cuba. The high-quality color photographs were taken by delegates from the International Red Cross during a visit to Guantanamo last year for the purpose of sending them to the detainee's family, government officials and a spokesman for the ICRC told NBC News. In some, Binalshibh smiles broadly. In others, he holds what appears to be a Quran, or prays. 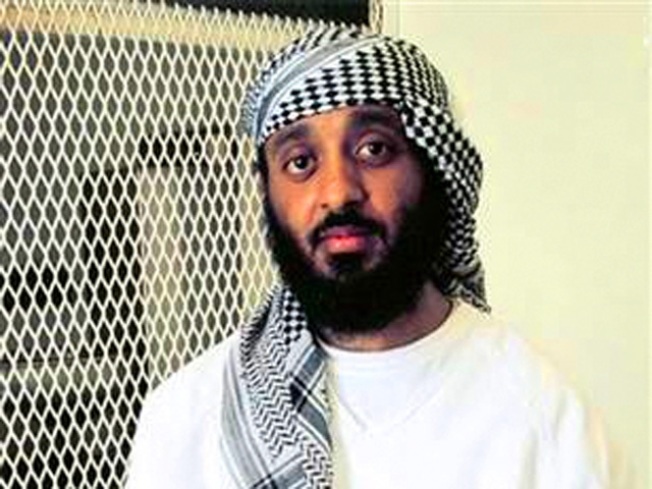 Two government officials confirmed to NBC that the photos did in fact appear to be Binalshibh, who as one of the prime plotters of the attacks on the World Trade Center towers and the Pentagon remains among the most notorious of the detainees at Guantanamo. Commentators on the al Fallajuh Islamic Forum, a major social networking site for al-Qaida, used the photos to extol Binalshibh. "Surprise ... a Gift to every Mujahid for the Cause of Allah. A Picture for one of the heroes of the Eleventh in Guantanamo Prison," one commentator wrote. Another added: "He's not smiling to the person with the camera but smiling at us as he knew that the picture will reach his brothers in Allah." "These photographs are perfect for propaganda — they show Binalshibh exactly as al-Qaida would want him to be," said Evan Kohlmann, a U.S. counterterrorism expert and NBC News analyst who first spotted the images on the website. Rather than a cowed or scared detainee suffering at Guantanamo, Binalshibh looks cheerful, pious and self-satisfied, he said. "He looks very pleased with himself," Kohlmann said. In one photograph, Binalshibh studiously reads the Quran. In others, he holds prayer beads and clutches what appears to be the Quran, his Gitmo cell in the background. The emergence of the photographs appears to undercut the extremely tight restrictions the Pentagon places on the distribution of any images of Guantanamo detainees and their surroundings. Those restrictions are especially tight for the "high value" detainees such as Binalshibh who are housed at Camp 7, a portion of Guantanamo that is off limits to outsiders. Defense Department officials refuse even to identify where Camp 7 is located or discuss conditions there. Even at other Guantanamo camps where the rules are looser the Defense Department prohibits the news media from photographing any detainees. But Tanya Bradsher, a Defense Department spokeswoman, said that the photos were taken under an agreement the Pentagon has with the ICRC to send photos to families. Once the photos are sent, she said, "we have no control over what the families do with them." This isn't the first time that Red Cross photos have appeared on al-Qaida websites. After the Red Cross began taking photos of detainees last year, images of a bearded Khalid Sheikh Mohammed, Binalshibh's alleged 9/11 co-conspirator and the prime architect of the attacks, made their way to al-Qaida websites. Asked for comment Monday, an ICRC spokesman e-mailed that delegates from the organization visiting Guantanamo last year were permitted by U.S. officials to take two photographs and five color prints of any detainees who agreed to pose for them with the understanding that the shots would be transmitted to their families. Most of the families "have not seen family members held at Guantanamo since their capture as early as 2001," the spokesman said. Binalshibh was captured in Pakistan in September 2002. "The photographs of the detainees that were taken by the ICRC are now the property of the families to whom they were sent," the ICRC spokesman said. "As we consider the exchange of letters and photographs between individual detainees and their families to be private correspondence, we are not at liberty to comment on details concerning Mr Binalshib. Obviously, it is up to the family to decide now whether or not they want to make any of this correspondence public." The photos showing a seemingly healthy and happy Binalshibh could undercut an argument used last year by his defense lawyers, who said that after being held for years incommunicado in CIA prisons and subjected to torture, he was suffering from a psychotic disorder and was not mentally competent to stand trial for plotting the 9/11 attacks. The attorneys' motion on the issue was put on hold when the military commission charges against Binalshibh and the other alleged 9/11 plotters were withdrawn. The Obama administration is currently trying to decide whether Binalshibh, Mohammed and other accused co-conspirators should be tried in federal court or their case should be revived before military commissions at Guantanamo.